There is still time to get some fishing in before the end of the season. Charles Rangeley-Wilson picks the best trout rivers in the UK and Ireland for fly fishing. Wild trout fishing is an aspiration for many fishermen. The top 10 trout rivers in the UK and Ireland offer the opportunity of brilliant sport wherever in the country you find yourself. From the Piddle in Dorset to the Lyon in Perthshire and the Suir in Ireland these rivers are top spots to catch trout. Just pack your bags and go fishing. And when you have caught your trout we have the best trout recipes to ensure you are never bored by your catch in the kitchen. When I lived in the South West my season would open on the East Lyn. In March and April early hatches are as good as guaranteed in the sheltered gorge that the Lyn has carved itself in its journey off Exmoor. There’s no hurry to fishing here in spring: start late and fish on through till tea. Large dark olives will hatch on and off for three hours and the fizzy little trout of the Lyn strike at them like rattlesnakes. You need a light rod and an ability to look on a 12oz fish as a specimen. There’s a great pub in Rockford for somewhere to stay, eat, drink and buy permits: The Rockford Inn. One of the best all-rounder game rivers in England: record grayling, record sea-trout, record brown trout and, if not quite record salmon, then bloody big ones. The story (“A Dry Fly Record”, Fishing Gazette, 11 September 1907) of Filleul’s monster 13lb brownie landed in the dark in a clothes basket on the outskirts of Dorchester sums up this river’s ability to surprise. 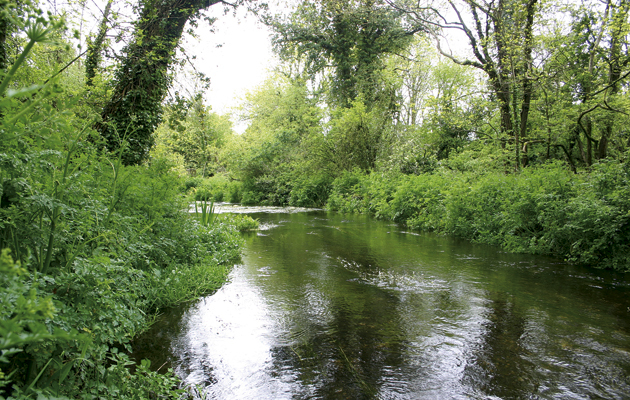 But for plain old sublime dry fl y-fi shing, for big hatches and game, free-rising wild trout, head upstream to the fat of the river between Dorchester and Maiden Newton on the 30th of May – give or take a fortnight. Richard Slocock can provide permits for beats at Maiden Newton, Frampton, Grimstone and Wrackleford: visit Go Fly Fishing. The River Piddle is a small rural Dorset river which rises next to Alton Pancras church. I love chalkstreams: constant, cool, fertile – they make the best of trout rivers. Or they would do if we hadn’t sacrificed them to cheap food and easy water. There are few that flow quite as they should, but of those that do the Itchen is the tops. I mean that in the sense that it is the ultimate expression of what a chalk river is all about: it has the clearest water, the biggest hatches, the fussiest fish. And in the few miles between the Worthys and Alresford it is as perfect as perfect gets in that blousy valley of boggy, snipey meadows. It fishes well all season long, trout rise on the upper river all the time – it is phenomenal. And up here it isn’t stocked either. It is not an easy river to get to fish, but keep an eye out for days in the Wild Trout Trust auction. march browns and large dark olives hatch in waves and the trout turn on and off like a disco ball. And while it used to be a tricky river to get access to, a new passport scheme has opened huge tracts of the stream to easy day-ticket access: Wye Usk Foundation. Auden wrote a poem In Praise of Limestone and ended it when I try to imagine a faultless love/Or the life to come, what I hear is the murmur/Of underground streams, what I see is a limestone landscape. Which might be the same as saying that a limestone landscape is heaven on earth. It is. He starts the same poem: “Mark these rounded slopes/With their surface fragrance of thyme and, beneath,/A secret system of caves and conduits; hear the springs/That spurt out everywhere with a chuckle,/Each filling a private pool for its fish and carving/Its own little ravine whose cliffs entertain/The butterfly and the lizard.” Last summer I fished for a day through a landscape like this and if I had one day left or an eternity of days just the same, I’d choose it again. If you haven’t fished the Derbyshire Wye you haven’t fished. You can get access through Cressbrook and Litton Fly Fishers and The Peacock at Rowsley. It seems just too big to be a trout river, but if you can unlock it the Tay will, when it fi nally shines on you, open trout fishing in a different dimension. I’ve cast size 22 gnats to 7lb trout in a river 50yd wide. I’ve caught two dozen fish in a non-stop June evening, none of which weighed less than a pound and one of which dragged me 200yd downriver. I’ve hooked fish I swore were boulders but for the fact they were swimming. The Tay is an inscrutable trout stream all right, but when it smiles – wow! My favourite spots are at Dunkeld (tickets from the Spar Shop, 3 Murthly Terrace, Birnam, Perthshire, tel 01350 727395) and Kenmore (tickets from the Post Office, The Square, Kenmore, Perthshire, tel 01887 830200). Further details available from Angling in Tayside. Like its downstream cousin, the Lyon is moody. Actually the Lyon is bipolar. There are days when you’ll swear there is nothing in it. But there are days when it boils like porridge. The morphology of the Lyon creates miles of nothing interspersed with pockets and runs full of trout. Or full of one big trout. You need to winklepick the Lyon. And you need to cover a lot of ground, judging carefully where to spend your time. You’ll learn it by being there when it lights up, by seeing the fish where you thought there were none. It is worth the effort; there are some whoppers in that glen. Did I mention that it also happens to be about the most beautiful place in Scotand? Permits are available at the Post Office, Bridge of Balgie, Glen Lyon, tel 01887 866221. Thirteen years ago now I was shown the River Suir at noon on a remorselessly hot day in June. Only a few fish moved, the far side of a wide stream, and once only. The place looked underwhelming and I might have left but Andy Ryan told me to hang about, mentioning – in that take-it-or-leave-it manner which in Ireland signifies a pearler – that the bluewinged olives might get along a bit before long. I have never seen a hatch or fall like it. A biblical plague. A darkening of the sky. And later, as the real dark fell, the river like fly soup, and trout rising in it – spotty whales gorging on krill. For access contact Andy Ryan at Fly Fishing Ireland. I had six days here the same year I found the Suir and can’t think why I’ve not been back, but for the fear it might not be as good. It flowed lazily through plashy meadows full of wild orchids and only the occasional cow. It flowed fast between beards of green weed and in deeper parts it curled up like a snake. For a while it dropped through a deep, cold wood. And it was bonkers full of trout. They weren’t massive, though they were fat. But nowhere else have I experienced the crossword puzzle of match the hatch in quite such a cryptic way. Talk about nibbling your tippet down to the quick. Be prepared to change flies 50 times in one evening. For access visit Fly Fishing Ireland 0r email Andrew Ryan. Originally selected in May 2009. As for the top five flies you’ll need to fish these heavenly spots… you won’t go far wrong with these. If you forsake all else keep a Parachute Adams in your box. Carry it in all sizes, 12 through to 20 and you’ll do a decent job of matching most hatches, mayfly through to teeny olives. An Elk-hair Caddis will take care of another large chunk of the watery insect kingdom. Again, sizes 12 through 20. Going underwater one fly will catch fish no matter what: a Hare’s Ear Nymph. Either tie them yourself or order them with black tungsten beads, and make sure they are skinny, not fat and overdressed. In all honesty, you won’t really need another nymph. The Hawthorne fly is a gangly-legged beastie that gets blown on to rivers early season. But the pattern used to represent it also does a fab job of looking like a whole menu of gangly legged, midge-, ant- or beetle-like flies, insects that trout jump on all season long. Make room for a Sherry Spinner, again in a range of sizes. You won’t need it often but when you do, on late summer evenings, nothing else will suffice. Like any top 10 list mine will cause an argument with anyone whose top 10 would be different (just about everyone) and especially those whose favourite haunt is not on it. I could have written about so many others: in the South West the Dart and the Barle – both fabulous moorland streams like the Lyn. From the chalk country I have left out rivers such as the Wylye, the Ebble and, of course, the river they run into, the famous Wiltshire Avon. From the north of England the Wharfe, the Eden, the Swale, the Ure. In Scotland how could I not have included the Don or Tweed? But like any top 10 it is a personal list. It is composed of the rivers I know well and that you can get to fish, too. If I had to confine my efforts from here on in to 10 only – well, I’d stick to these.